Rick Fedrizzi is on a mission to improve health by creating better buildings and architectural design ecosystems. He was the speaker for last night’s University Lectures Series. Fedrizzi, a SU alum, was the founder of US Green Building Council and currently CEO of Well Certified. Here’s a good dose of self-esteem for Central New York. Our region is actually ahead of the curve in terms of planning and implementing green infrastructure and sustainability. Linda Dickerson-Hartsock, Owen Kerney and Andrew Potts were in Philadelphia last week to present the Syracuse experience at the GreenBuild International Conference and Expo. Matt Millea and Matt Marko from the Center of Excellence also presented at the conference. 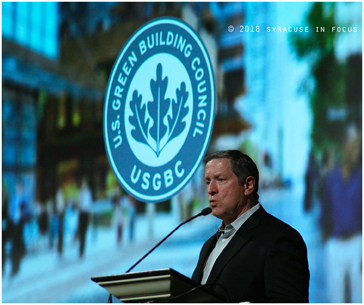 The keynote speaker at Greenbuild was former New York Senator Hillary Clinton.